The Salter Harris Type II fracture differs from the Type I variety, mainly because the Type II fracture extends into the metaphysis of the gone, or the area of the bone located proximal, or before the growth plate; typically the shafts of long bones. As the forces exerted on the bone at the time of injury cause the fracture to "shear" across the growth plate, part of the metaphysis of the bone is fractured and pulled away with the distal fragment, or the piece between the growth plate and the end of the bone. 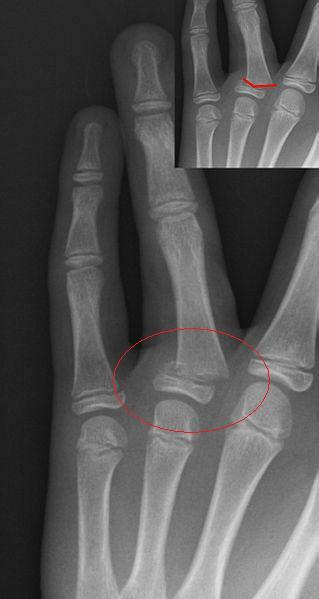 The picture below represents a Salter-Harris-Type-II fracture of the proximal phalanx in the hand. Notice the small piece of bone that remains attached to fracture fragment closest to the hand. The Type II fracture, together with the Type I, combine to make up the majority of pediatric long bone fractures seen in emergency rooms and physician offices. This fracture type can present with grades of severity ranging form the least severe; non-displaced (not out of position)to the grossly displaced variety which would require reduction, or setting of the bone.